About the topic "Sum of all 3 digit numbers divisible by 6"
"Sum of all 3 digit numbers divisible by 6" is a difficult problem having had by the students who study math to get prepared for competitive exams. For some students, getting answer for the questions like "Find the sum of all 3 digit numbers divisible by 6" is never being easy and always it is a challenging one. Once we know the concept and method of solving, solving the above problem will not be a challenging one. The first 3 digit number is also 100. We have decimal in the result of 100/6. We have decimal in the result of 101/6 also. Here, students may have some questions on the above process. 1. Do we have to divide the 3 digit numbers by 6 starting from 100 until we get a 3 digit number which is exactly divisible by 6 ? 2. Will it not take a long process? 3. Is there any shortcut instead of dividing the 3 digit numbers 100, 101, 102.... one by one? There is only one answer for all the above three questions. That is, there is a shortcut to find the first three digit number which is exactly divisible by 6. What has been done in the above shortcut? The process which has been done in the above shortcut has been explained clearly in the following steps. To get the first 3 digit number divisible by 6, we have to take the very first 3 digit number 100 and divide it by 6. When we divide 100 by 6 using long division as given above, we get the remainder 4. Now, the remainder 4 has to be subtracted from the divisor 6. When we subtract the remainder 4 from the divisor 6, we get the result 2 (That is 6 - 4 = 2). Now, the result 2 in step 3 to be added to the dividend 100. Now, the process is over. 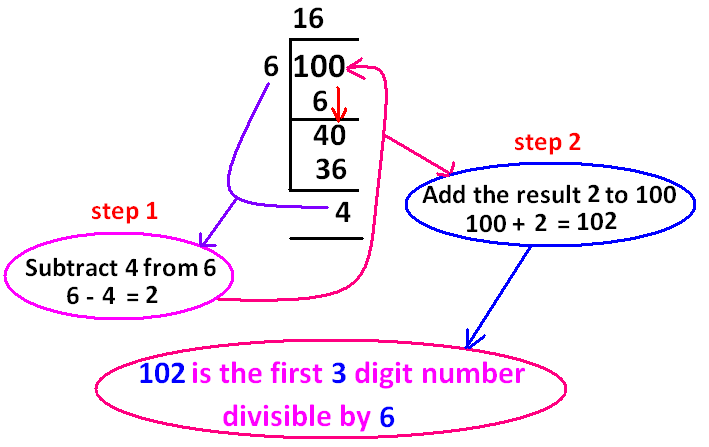 This method is not only applicable to find the first 3 digit number exactly divisible by 6. It can be applied to find the first 3 digit number exactly divisible by any number, say "k"
To find the last 3 digit number divisible by 6, we divide the very last 3 digit number 999 by 6. We have decimal in the result of 999/6. Clearly the last 3 digit number 999 is not exactly divisible by 6. Let us divide the preceding 3 digit number 998 by 6. We have decimal in the result of 998/6 also. 1. Do we have to divide the 3 digit numbers .......997, 998, 999 by 6 until we get a 3 digit number which is exactly divisible by 6 ? 3. Is there any shortcut instead of dividing the 3 digit numbers ...........997, 998, 999 one by one? That is, there is a shortcut to find the last three digit number which is exactly divisible by 6. 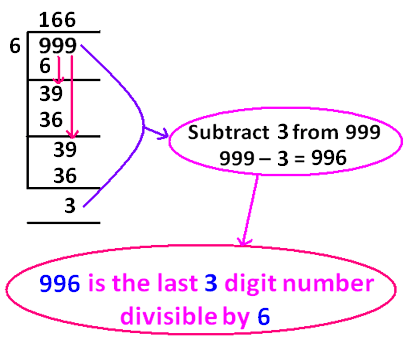 To get the last 3 digit number divisible by 6, we have to take the very last 3 digit number 999 and divide it by 6. When we divide 999 by 6 using long division as given above, we get the remainder 3. Now, the remainder 3 has to be subtracted from the dividend 999. When we subtract the remainder 3 from the dividend 999, we get the result 996 (That is 999 - 3 = 996). So, 996 is the last 3 digit number exactly divisible by 6. This is how we have to find the last 3 digit number exactly divisible by 6. The process of finding the first 3 digit number exactly divisible by 6 and the process of finding the last 3 digit number exactly divisible by 6 are completely different. Be careful! Both are not same. The methods explained above are not only applicable to find the first 3 digit number and last 3 digit number exactly divisible by 6. They can be applied to find the first 3 digit number and last 3 digit number exactly divisible by any number, say "k"
Let us see how to find the sum of all 3 digit numbers divisible by 6 in the following steps. The first 3 digit number divisible by 6 is 102. After 102, to find the next 3 digit number divisible by 6, we have to add 6 to 102. So the second 3 digit number divisible by 6 is 108. In this way, to get the succeeding 3 digit numbers divisible by 6, we just have to add 6 as given below. Clearly, the above sequence of 3 digit numbers divisible by 6 forms an Arithmetic Progression. The method explained above is not only applicable to find the sum of all 3 digit numbers divisible by 6. This same method can be applied to find sum of all 3 digit numbers divisible by any number, say "k". When students have the questions like "Find the sum of all 3 digit numbers divisible by 6", in competitive exams, they are stumbling a lot to solve. If we know the way of solving, getting answer for the questions like "Find the sum of all 3 digit numbers divisible by 6" is not a difficult task. We hope, after having seen the methods and steps explained above, students will not find it difficult to answer the questions like "Find the sum of all 3 digit numbers divisible by 6".